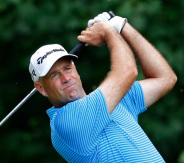 Cink Charities is excited to announce that Stewart Cink will be hosting the Monday Pro-Am at the Mitsubishi Electric Classic on Monday, April 15th, 2019 at the newly renovated TPC Sugarloaf. Participants in the event will enjoy a unique gifting experience, food and beverage throughout the day, participate in an interactive golf clinic led by Stewart Cink, and then be paired with a PGA TOUR Champions legend for an incredible golf experience. Together with the commitment of the presenting sponsors TransAmerica/WFG and long-time Cink Charities partner Vensure Employer Services, proceeds from the Monday Pro-Am will benefit Gwinnett Medical Center’s NICU and Breast Cancer Center, and Obria Medical Clinics of Georgia. For complete event details and how to participate in the Monday Pro-Am, please click here.